The University of Toledo's bachelor of business administration (BBA) degree in accounting can be completed entirely online. You get the same robust academic program with the added flexibility of online classes. Check if UToledo is authorized to offer 100% online courses in your state. 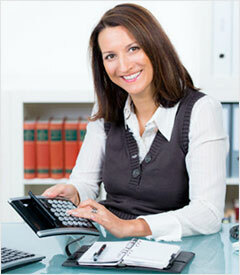 Accountants are employed in the public, business and government sectors. UT accounting majors find jobs as everything from budget analysts and payroll specialists to chief financial officers. Flexible track to success. Choose online classes that fit your schedule. Enroll full time or part time. Online resources. UT Online provides cutting-edge online technologies and innovative teaching practices. UToledo online accounting students have full access to UT’s online resources, including eLibrary, IT Help Desk and eTutoring. Extra attention and support. Enjoy personalized attention from Accounting Department faculty and the College of Business and Innovation's Office of Student Retention and Academic Success. UT graduates get jobs. Our job placement rate for accounting students is 93%. Average starting salaries are $50,000. Outstanding CPA pass rate. UToledo has one of the best online accounting degree programs in the nation. Its CPA exam pass rate has exceeded national averages for the past 10 years. Accredited. UToledo’s accounting department is one of just 2% worldwide to be accredited by the Association to Advance Collegiate Schools of Business International (AACSB). Grad school options. UToledo’s one-year master of science in accountancy graduate program offers online and evening courses. The MSA program isn’t entirely online but was recently ranked among the Best Online Master's in Accounting Degree Programs by College Choice. University of Toledo accounting graduates are prepared for careers in public accounting, business and government. They are hired by some of the biggest local and national companies, including PricewaterhouseCoopers; Ernst & Young; Owens Corning; and Libbey. "Employers love our graduates because of their professionalism and work ethic, technical knowledge and skills, and leadership capabilities. Our students are better prepared compared to students from other programs in the region to apply their knowledge to practical situations while learning quickly on the job." UToledo's online accounting bachelor's degree program offers the same comprehensive courses as the on-campus program.